The training will review how to efficiently do market research, write a winning business plan and make plans to offer a product or service to the group of people who can't wait to get their hands on it! This training is a recorded webinar taught by Deb Bilbao, Business Consultant at the WBC. 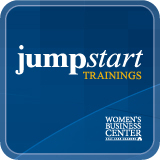 You are welcome to sign up for free one-on-one business consultation after attending Jump Start! Consultation is through appointment only, so we highly encourage you to attend and set an appointment! This webinar is intended for all entrepreneurs; those looking to go into business, early start-up stage or those looking to improve an existing business. Once you register, you will receive a link to access the course. You will need to create a free account on Teachable.com in order to enroll in the course.